When I was a child I spent my days collecting and exchanging trading cards of my childhood TV shows. I owned hundreds of paperback books where Sailor Moon and Garfield sticker cards rested, never to be seen again. But I wasn’t the only one doing it. It was the trend back then. The trading card fever was so high that it wouldn’t be surprising if you stopped in the middle of the street to exchange these with a lost soul looking for that missing puzzle piece. If business owners really wanted to increase productivity back then, they should have advertised their products in the form of trading cards. Luckily, we can always learn from our mistakes. As technology evolved, a new form of collectibles came along: The Meme. This virtual graphic most often refers to an image that conveys some kind of feeling with a short message (not much attention span needed). These messages can trigger feelings of motivation, anger, and happiness, among other sentiments. Memes are usually accompanied by text or just a simple image. That’s where creativity comes in. But why do people obsess over these “virtual trading cards” as I like to call them? Memes are usually relatable to a large audience. Therefore, these memes are highly sharable on Social Media sites by multiple users. Do I really have to say what this can do to your product/service? Just think of those hundreds of thousands of trading cards being sold daily and the millions of views they got from parents, teachers and students. Now, let’s move on to a more hands-on topic. How Should You Create Your Memes Strategy? Study your Social Media audience and overall clientele carefully. Ask yourself these questions: What do they tend to share on Facebook? Do they prefer humorous content or inspirational content? Are their profiles for personal or professional use? The key is to be able to give them memes they won’t be able to resist sharing on their profiles. It always helps to conduct a survey beforehand. Use Surveymonkey.com to find out what your audience likes. Now that you have all the Intel from your audience, it’s important to start planning the actual strategy. My recommendation is that you get together with your team in order to hash out who will be responsible for what. Fortunately, memes can be created by a variety of people on their iPads and Android phones. So, let those creative juices flow, and come up with a line of memes you can start advertising on your Social Media platforms. If all goes well, you should start seeing increased engagement on your Social Media platforms. The meme strategy works best if you already have an initial following and a decent amount of authority. Be sure to track your success. After you’ve executed your strategy ask yourself: How viral did my memes get? Did some get more than others? How can I improve on this? Lucky for you, memes aren’t going anywhere anytime soon. People have always loved images throughout history; it’s just a matter of which platform they are shown under. In order to facilitate the meme creation process, I’ve decided to provide you with free meme making tools that will hash out these virtual messages in no time. This tool is free and extremely easy to use. When you enter the page, you will have the chance to search through homemade memes by “Featured”, “Trending” and “Browse”. I would recommend you take a look at these in order to give yourself some ideas before you start making your own. 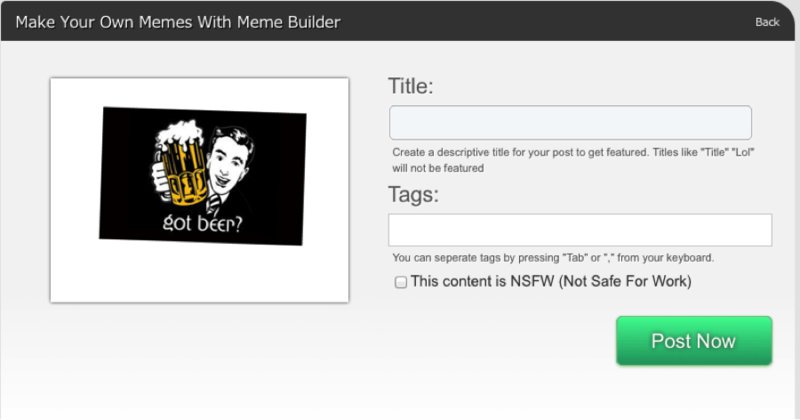 In the features section, you will have the chance to view selected templates that you may want to consider for your meme creation strategy. Once you are ready to start crafting your own memes, click on the “Upload” button and choose an image from your computer. Don’t forget to enter a title for your meme. I almost always use the actual meme text as a title in order to users to find it more efficiently. Once you do, your image will pop up and you will have the chance to add a written message. Hit the “Save” button and share it right on your Facebook page and other Social Media sites. 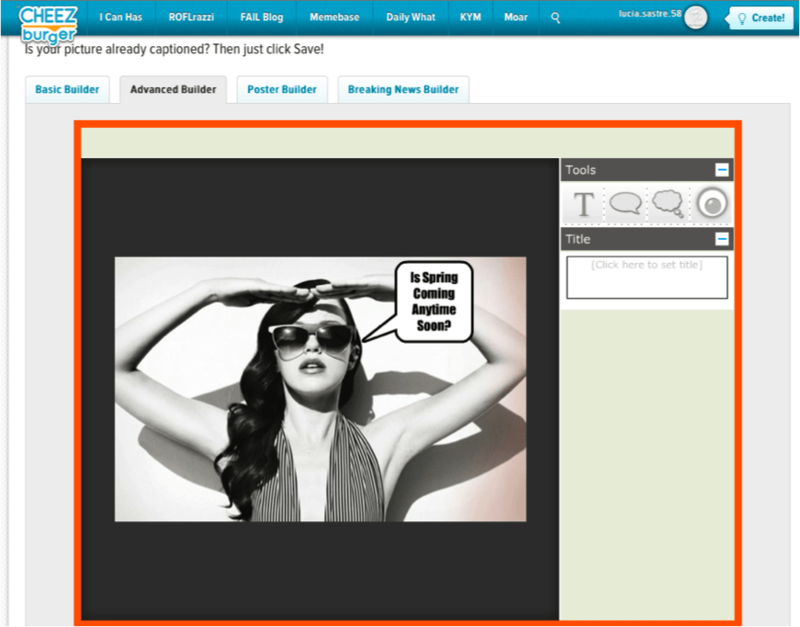 Another tool that I love to use when creating memes is CheezBurger.com. This website allows you to create a selection of graphic content ranging from comic strips to original memes. Plus, their content will have you cracking up! 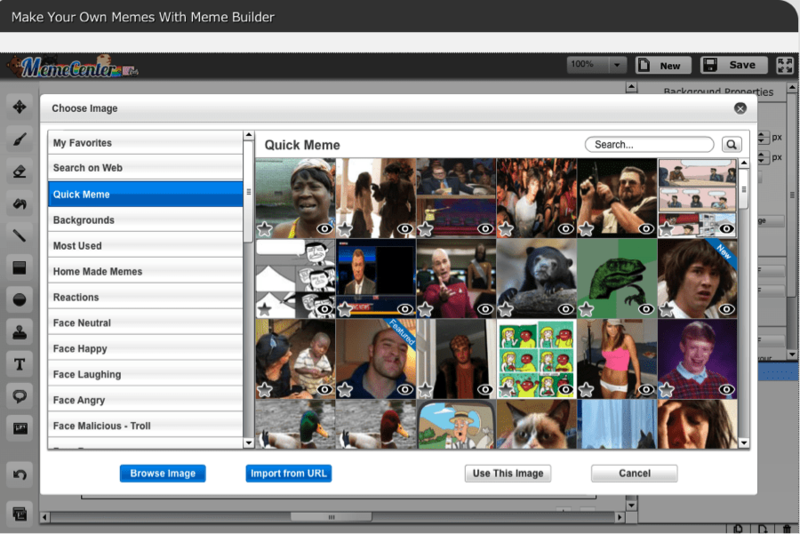 The easiest way to go about creating a meme with this tool is by using the “Advanced Builder.” This option allows you to customize your memes with dialogue boxes and various templates. 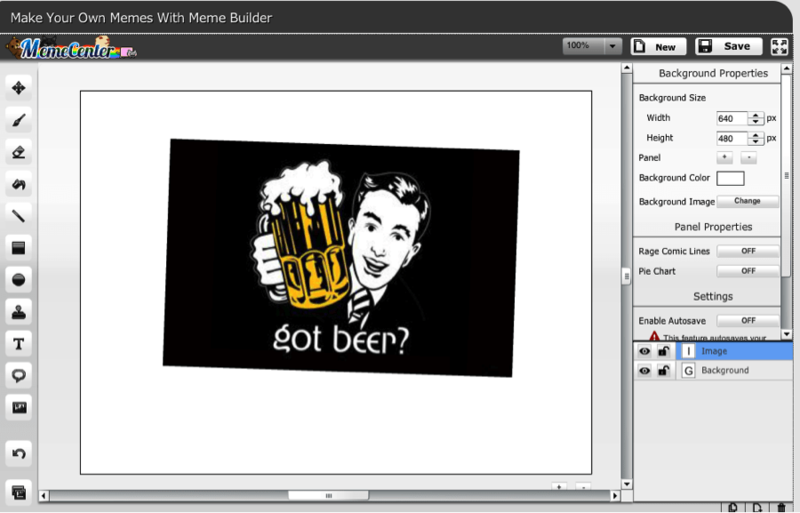 I also tend to use “Poster Builder,” which gives your memes a printing option. Once you’ve completed your meme, you’ll be able to see it live! Don’t forget to share it! 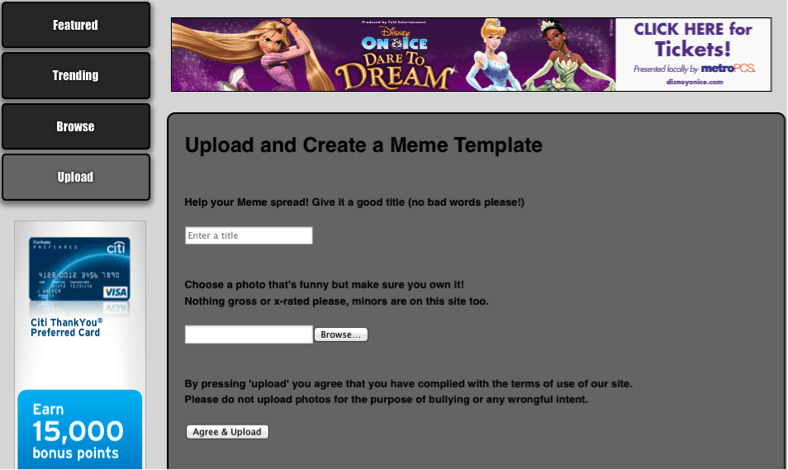 MemeCenter.com is perhaps the most in depth and detailed meme making program. At first, it may be a bit confusing due to all the features it has. Do not fear! 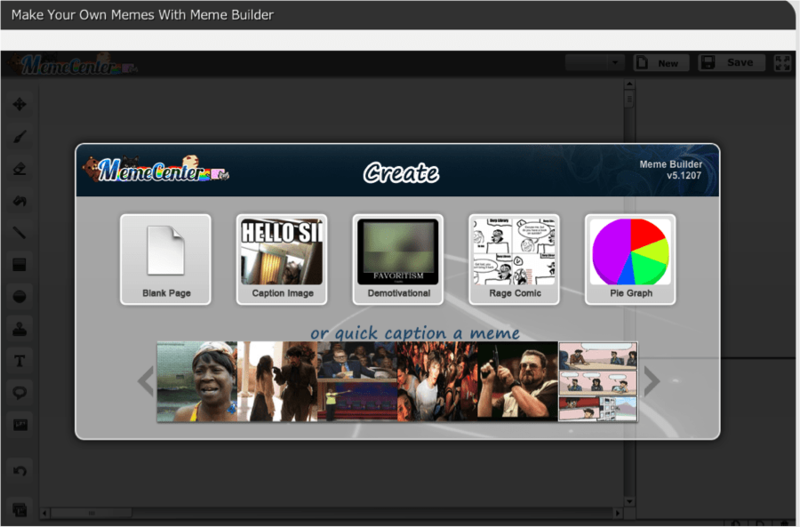 I’m going to explain how to make a meme step-by-step. 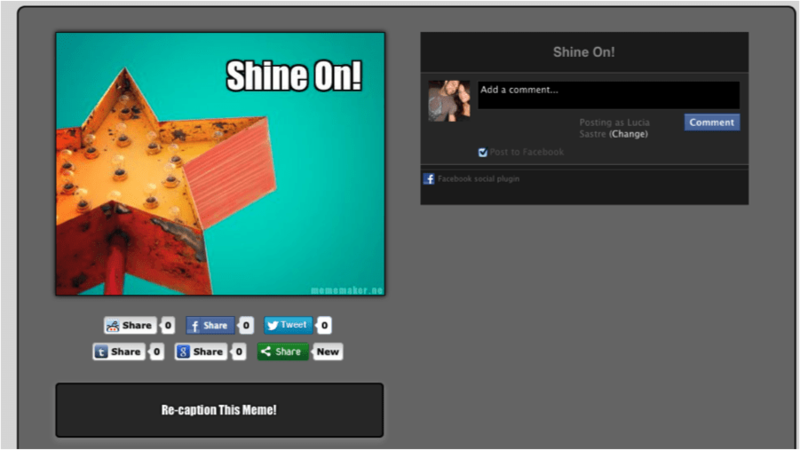 The MemeCenter allows you to create a variety of graphics including caption images, rage comics and pie graphs. I usually just go with the blank page option so I have a little more creative ground to work with. Once you’ve finalized your meme, click the “Save” button. You will be asked to either save it to your computer or post it to the MemeCenter. I would go ahead and do both in order to ensure exposure. Once you’re done, you know the routine! Share it! Now that you know the basics it’s time to take advantage of this new trend. As the world moves from the physical realm to the digital, so do our interests and hobbies. 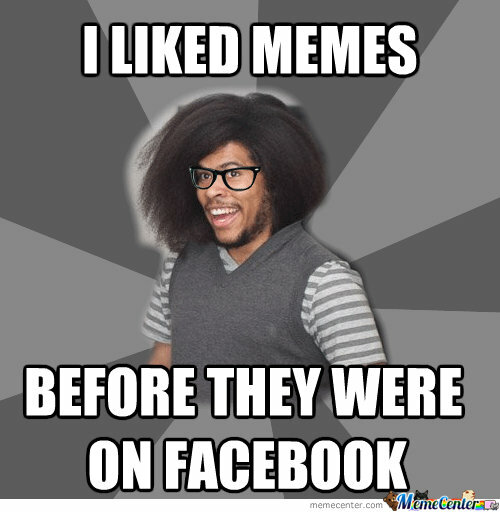 Memes are the new trading cards and as such, are some of the most sharable content available to marketers. So why not take advantage of this latest trend and increase your Social Media engagement by creating a few “trading cards” of your own? If you’re having trouble building a following on social sites or if you’re struggling to engage your audience, check out some of our other articles and contact us today!